Currently there are three important issues with world energy usage. The most vocal is global warming and greenhouse gasses. The second is cost and efficiency. The third is meeting energy demand. 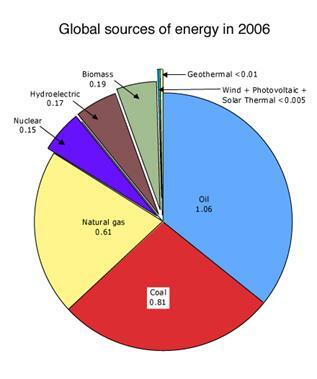 The below image illustrates how energy is being used globally as of 2006, which is not much different from today’s usage. If we break down the above pie chart by greenhouse gas emission, only nuclear, hydroelectric, geothermal, wind, photovoltaic and solar thermal are neutral, the rest contribute substantially to creating greenhouse gas emissions. In particular oil and coal are the worst, but are the most used. Below is a link to an article that communicates CO2 emissions per country. The graph below indicates the past and continued use of different energy forms. From it, clearly, there does not appear to be much relative change to the variation of type or amount of usage going forward to 2030. However, both the U.S. and China have fast growing renewable energy industries, particularly China. 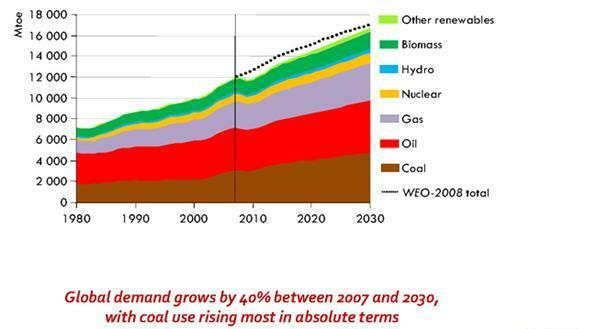 The challenge is to increase “Other renewable” far beyond what this graph indicates. The following link provides detailed energy usage by type and amount for each country. The following links provide the percentage of electricity generation by fossil fuel and coal per country. These lists are good guides to determine how likely you are to be contributing to greenhouse gases by using electricity, mainly in your home. If your country has a percentage greater than 20% on either of these lists, then you are a good candidate to considering switching to renewable sources of energy as a way of reducing overall greenhouse gas emissions. Cost, efficiency and demand are the big variables. Regarding efficiency, renewable energy development is still a free-for-all as each form strives to become effective, whether as a ubiquitous system, e.g., photovoltaics and geothermal heating using heat pumps, or within a niche, e.g., generating electricity from waste. This technology race and development will continue for some time. It is creating great speculation for capital investment from entrepreneurs who are trying to spot winners. The following link to an article from the Guardian communicates that in 2008 investment in renewable energy surpassed that of fossil fuel. Lastly, energy demand is so huge that weaning ourselves from the traditional sources of energy creation requires a substantial effort, and this is where action by individuals can potentially shift the energy landscape.